Dr. Paula Caplan Ph. D. is an American clinical and research psychologist and social justice and human rights activist. I first came across Paula and her work about 20 years ago. At that time, I was rapidly losing faith in my medical training in mental health. I was becoming increasingly disillusioned with the medical approach to human distress, including the whole medical approach to psychiatric diagnosis, which made progressively less sense to me the more I critiqued it. Back then, I was grateful to find principled mental health professionals like Paula Caplan and Peter Breggin. Paula Caplan’s CV is impressive. She was previously professor of psychology, assistant professor of psychiatry and head of the Center for Women’s Studies at the University of Toronto. She has received much recognition for her work including an Eminent Woman Psychologist award in 1996 from the American Psychological Association, a 1995-96 Presidential Citation for Contributions as Chair of Sexism in Diagnosis Task Force, and a Distinguished Career Award in 2008 from the Association for Women in Psychology. I have not yet have the pleasure of meeting Paula, though I’m sure that our paths will cross, given our shared passion for truth in mental health. We have been in regular contact over the years. For more information on my books, visit my website https://doctorterrylynch.com/ , where you can download two free chapters, one from each of my most recent books, Depression Delusion and Selfhood. This entry was posted in Blog, News and tagged American Psychological Association, brain chemical imbalance, chemical imbalance misinformation, depression, Depression delusion, Diagnostic and Statistical Manual of Mental Disorders, Dr. Paula Caplan, Dr. Peter Breggin, Dr. Terry Lynch, DSM, DSM-4, DSM-IV, mental disorders, mental health, psychiatry on 26th October 2015 by drterry. Many people are under the false impression that the diagnosis of depression is solidly grounded upon scientific principles. “Science plays no part in the diagnosis of depression. The Diagnostic and Statistical Manual of Mental Disorders (DSM) lists nine criteria which psychiatrists have decided provide evidence of depression. Neither laboratory investigations nor physical findings specific to depression receive a mention in any of these nine criteria. Criterion 1 describes the mood in a major Depressive Episode as ‘depressed, sad, hopeless, discouraged’, or ‘down in the dumps’, feeling ‘blah’, having no feelings or feeling anxious, irritability, and bodily experiences such as aches and pains. Criterion 2 refers to loss of interest or pleasure, including a loss of interest in hobbies. Criterion 3 describes changes in eating habits, either an increase or a decrease in appetite or weight. Criterion 4 refers to sleep disturbance such as insomnia or oversleeping. Criterion 5 describes bodily expressions of distress including ‘agitation, e.g. the inability to sit still . . . or retardation e.g. slowed speech, thinking or bodily movements’. Criterion 6 refers to decreased energy, tiredness and fatigue. Criterion 7 includes a ‘sense of worthlessness or guilt, unrealistic negative evaluations of one’s worth’, and ‘guilty preoccupations or ruminations’ about the past. Criterion 8 describes people’s reported ‘inability to think, concentrate or make decisions’, appearing ‘easily distracted’, or ‘memory difficulties’. Criterion 9 speaks of ‘thoughts of death, suicide ideation, or suicide attempts’. The Diagnostic and Statistical Manual of Mental Disorders asserts that a diagnosis of a Major Depressive Episode can be made when the severity and duration of a person’s mood meets Criterion 1 and the person is experiencing four of the remaining eight criteria. Carlat: How did you decide on five criteria as being your minimum threshold for depression? Spitzer: It was just consensus. We would ask clinicians and researchers, “How many symptoms do you think patients ought to have before you would give them a diagnosis of depression?” And we came up with the arbitrary number of five. Carlat: But why did you choose five and not four? Or why didn’t you choose six? Spitzer: Because four just seemed like not enough. And six seemed like too much. Carlat commented that ‘Spitzer smiles mischievously’ as he uttered the last sentence above. This is the quality of the “science” upon which the diagnosis of depression is based ” (end of quote). “The arbitrary number of five”, “It was just consensus”, “four seemed like not enough”, “six seemed to much”–does this rationale fall within your definition of science? Not for one second am I questioning the realness of these experiences and behaviours, but I most certainly am questioning the medical profession’s interpretation of these experiences and behaviours. [i]. Terry Lynch, Beyond Prozac: Healing Mental Distress, Ross-on-Wye: PCCS Books, 2004, p. 103. [ii]. Daniel Carlat, Unhinged: The Trouble with Psychiatry—A Doctor’s Revelations about a Profession in Crisis, London: Free Press, 2010, pps. 53-4. This entry was posted in Blog and tagged brain chemical imbalance, chemical imbalance, depression, depression criteria, Depression delusion, Depression diagnosis, Diagnostic and Statistical Manual of Mental Disorders, Dr. Daniel Carlat, Dr. Robert Spitzer, Dr. Terry Lynch, DSM-3, DSM-III, psychiatry on 24th October 2015 by drterry. I am delighted to be the keynote speaker at the William Glasser Institute of Ireland (WGII) Annual Conference this Saturday October 24th 2015 at St. Patrick’s College, Drumcondra, Dublin. I greatly value my relationship with the William Glasser Institute in Ireland and internationally. This relationship extends over te past 15 years. It began when Brian Lennon sent American psychiatrist William Glasser a copy of my first book Beyond Prozac: Healing Mental Distress. Bill loved the book, and he asked me to write the foreword to his book Warning: Psychiatry can be Hazardous to your Mental Health. I have heard it said that during his more than 50 years as a psychiatrist, Bill Glasser never prescribed psychiatric drugs. Instead, he devoted his life to empowering people and alleviating pain and distress. He is the creator of Choice Theory and Reality Therapy. Sadly Bill Glasser died in 2013, age 88 years. The William Glasser Institute continues to honour his legacy in Ireland and Internationally. Dealing with reality and the fact that we are all choice-makers are two core themes of Bill Glasser’s legacy. I have spoken previously at the WGII annual conference and I am very happy to do so again. This entry was posted in Blog, News and tagged Choice Theory, Dr. Terry Lynch, Dr. William Glasser, mental disorders, mental health, mental illness, psychiatric drugs, psychiatry, psychotherapy, Reality Therapy, Warning: Psychiatry can be Hazardous to your Mental Health, WGII, William Glasser institute, William Glasser Institute of Ireland on 22nd October 2015 by drterry. Every year for the past few years, the William Glasser Institute hold a Mental Health & Happiness Summit on World Mental Health Day, 10th October. This summit consists of a series of hour-long talks and conversations with people in the mental health sphere. The talks occur consecutively throughout the 24-hour period of World Mental Health Day. I’ve had a long association with late US psychiatrist William Glasser and the William Glasser Institute. I have been involved in the Mental health & Happiness Summit in 2014 and again in 2015. My conversation with Nancy Buck was wide-ranging, covering many aspects of emotional and mental health, psychiatric diagnoses, recovery, and happiness. I believe the system works by clicking the image of the speaker you might like to hear, at the time of that talk. Clicking the speaker before or after that speaker’s appointed time won’t bring you to their talk, as another speaker will be talking at other times. It is fitting that William Glasser’s wife Carleen is the first speaker. This entry was posted in Blog and tagged bipolar disorder, chemical imbalance, chemical imbalance misinformation, depression, Dr. Terry Lynch, Dr. William Glasser, mental disorders, mental health, mental health recovery, mental illness, Nancy Buck, psychiatry, psychotherapy, schizophrenia, William Glasser institute on 10th October 2015 by drterry. 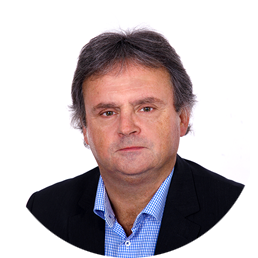 Podcast: Dr. Terry Lynch, guest on The Peter Breggin Hour, 7th Oct 2015. For a quarter of a century, I have been a big fan of US psychiatrist Peter Breggin and his tireless work to change global mental health from a system based on falsehoods and flawed science to an approach based on truth, real science, empathy and humanity. My relationship with Dr. Peter Breggin has grown from first seeing him on Irish television 25 years ago and reading his classic book Toxic Psychiatry to being an ally and comrade in the vitally important struggle to redress the global understanding of and approach to emotional and mental health. I contributed a comment or two and an endorsement to Peter’s important 2012 book Psychiatric Drug Withdrawal: A Guide for Prescribers, Therapists, Patients and Families. Peter wrote a wonderful endorsement of my 2015 book Depression Delusion Volume One: The Myth of the Brain Chemical Imbalance, referring to my book as “an inestimable service to humanity”. We discussed many topics including my new book Depression Delusion Volume One: The Myth of the Brain Chemical Imbalance and why I wrote it; a better way to understand depression, bipolar disorder, schizophrenia, obsessive compulsive disorder (OCD), eating disorders; antidepressants and other psychiatric drugs; psychiatry; psychiatric diagnoses; brain chemical imbalances; counselling and psychotherapy; recovery; and many other important themes. I was previously Peter’s guest in 2012. During our conversation both Peter and I agreed that we would not leave such a long period of time before we chatted again on his show. This entry was posted in Blog and tagged anorexia, antidepressants, bipolar disorder, brain chemical imbalance, chemical imbalance, chemical imbalance misinformation, counseling, counselling, depression, Depression delusion, Dr. Peter Breggin, Dr. Terry Lynch, eating disorders, listening, mental disorders, mental health, mental health recovery, mental illness, obsessive compulsive disorder (OCD), psychiatric drugs, psychiatric drugs and violence, psychiatric research, psychiatry, psychotherapy, schizophrenia, suicide on 9th October 2015 by drterry. This entry was posted in Media Kit on 8th October 2015 by admin. Antidepressant prescribing is out of control. Why? The prescribing of antidepressant drugs is now out of control. Antidepressant drug prescribing has risen year-on-year for two decades or more. Almost 60 million antidepressant prescriptions are now written annually in Britain, equivalent to one prescription a year for every UK man, woman and child. The inexorable rise in antidepressant prescribing has similarly continued in virtually all developed – and many developing – countries. Counselling and psychotherapy is “prescribed” far less that antidepressants by mental health doctors – psychiatrists and GPs (family physicians) – despite counselling’s proven effectiveness in the treatment of depression (see NICE guidelines). This major discrepancy cannot be explained by antidepressants perhaps being far more effective treatments for depression than counselling. Studies have found that the difference in effectiveness of antidepressants and active placebo is not clinically significant. (An active placebo is a substance that has no direct effect on the condition itself but does cause some effects, so the person knows they have taken something, as opposed to an inert or inactive placebo, which does not cause any effects at all). Psychiatrists and GPs repeatedly tell us that the major discrepancy between antidepressant prescribing and other modalities is down to economics – to underfunding. This claim is not the whole story, far from it. The fundamental problem is not a funding issue at all; it is the mindset that drives mental health health services, and the priorities that arise from that mindset. This mindset is largely the creation of those who lead mental health – psychiatrists and GPs, mental health doctors, society’s appointed foremost experts on depression. These doctors like to see depression as an illness, as fitting primarily into their familiar model of illness. It is therefore second nature for doctors to prescribe, since that is what doctors are trained to do. Their indoctrination into the medical system begins the first day they enter medical school. This is a deluded view. Depression does not fit into medically-accepted definitions of disease. In his excellent book The Body Keeps the Score, psychiatrist Bessel Van der Kolk correctly states that depression is a form of learned behaviour. There is an obvious cognitive dissonance about counselling for doctors. Counselling does not easily fit into the disease model as a “treatment”. It is not prescribed as a treatment for medical conditions generally, rather as a support for the person in dealing with their disease, but not as a treatment in itself. Therefore the idea that counselling can actually be a treatment in itself is a great deal more challenging for doctors to get their head around than prescribing. Many doctors do in time become comfortable with the idea of counselling as a “treatment”, but by then, the horse has bolted. Most doctors have little training in counselling, don’t really understand it, don’t know how to practice it. So counselling remains somewhat “out there” for many doctors, whereas prescribing antidepressants is very much within their worldview, their personal toolkit, their modus operandi. I have not heard any doctors calling for a cap on antidepressant prescribing in order to make more funding available for other therapies and approaches such as counselling. I am not suggesting that counselling is the only other valid option to antidepressants. In my next book, working title Depression: Its True Nature (expected publication date April 2016), I will set out a far more accurate way of understanding depression than that provided by the medical model. This understanding will present quite a challenge to the established medical view. 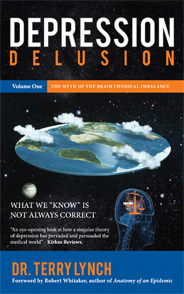 If you would like to be informed of developments regarding my next book and other updates, you can sign up for updates at my website https://doctorterrylynch.com/ and receive two free chapters, one from each of my two most recent books, Depression Delusion Volume One: The Myth of the Brain Chemical Imbalance and Selfhood: A Key to the Recovery of Emotional Wellbeing, Mental Health and the Prevention of Mental Health Problems. This entry was posted in Blog and tagged antidepressant drugs, antidepressant effectiveness, antidepressants, Bessel Van der Kolk, chemical imbalance, counseling, counselling, depression, Depression delusion, Dr. Terry Lynch, mental health, psychiatric drugs, psychiatry, psychotherapy on 7th October 2015 by drterry. For many years, serious questions have been raised about the possible role of psychiatric medication in violent crimes, including mass shootings. The number of such incidents where the individual was either on psychiatric medication, had very recently been commenced on medication, had a change in dosage or had stopped medication (usually suddenly) is considerable. Psychiatry’s answer to this issue is to generally blame the diagnosis – ie, that such violence is a feature of the diagnosis with which the person had been labelled. But is that good enough? Does psychiatry not owe it to the public it serves to actively investigate – openly, fully and honestly – whether there may indeed by real links between psychiatric drugs and violent crime? So why doesn’t psychiatry generally engage fully with this extremely important question? It comes down to psychiatry’s almost inevitable lack of objectivity on such matters. Official findings that would link psychiatric drugs to violent crime would be catastrophic for mainstream psychiatry on so many levels. It does not therefore surprise me at all that mainstream psychiatry appears to have little enthusiasm for addressing this issue openly and comprehensively. It doesnt surprise me, but it is not good enough. Many experts have been expressing deep concern about possible links between psychiatric drugs and violent crime for decades now, including psychiatrists Peter Breggin, David Healy and physician/researcher Peter Gotzche, co-founder of the highly respected Cochrane Collaboration. But because mainstream psychiatry repeatedly “reassures” politicians and the public that such concerns are unfounded, this issue does not get properly investigated. It is high time that this changed. When it comes to properly investigating mass gun and other violence, the gun lobby may not be the only group with major vested interests. This entry was posted in Blog and tagged Dr. David Healy, Dr. Peter Breggin, Dr. Peter Gotzche, Dr. Terry Lynch, mental disorders, psychiatric drugs, psychiatric drugs and violence, psychiatric research, psychiatry, violence and psychiatric drugs on 2nd October 2015 by drterry.